Hellfire is a hero in the Marvel universe he is most known for being on the Secret Warriors team. On the team he fell in love with Daisy Johnson and was later killed by Nick Fury. Hellfire is played by actor Axle Whitehead on the show Agents of SHIELD. If you love Agents of SHIELD as much as us then you will love this awesome SHIELD gear from Amazon. Hellfire is on the caterpillars list by Nick Fury. The list is said to have future but unknown super humans. Many on the list are children of prior heroes and villains. JT Taylor is the offspring of the villain Phantom Rider and through him acquired his own supernatural powers. Daisy Johnson was tasked with Fury to put together a secret team to battle the Skrull invasion. Using the Caterpillar list Daisy located and recruited J.T. Taylor. He was given the moniker Hellfire for his ability to imbue objects with Hellfire. Daisy and J.T. began to see each other romantically. J.T. was not happy working with Fury. He was hoping to be paid more handsomely for working in the dangerous profession. The only reason he stays on the team was because of his love of Daisy. The Secret Warriors steal a billion dollars from a Hydra bank and funnel the money to Dum Dum Dugan to create a new army for Fury. J.T. sees an opportunity to increase his own wallet and funnels some of the money to himself. Hydra manages to follow his transaction and tracks him down. They turn him into a double agent. His only request was for immunity for himself and Daisy. Fury finds out of the betrayal. On a mission at a Hydra base he pushes him off a cliff when no one is looking. Interestingly this is the same way the original Phantom Rider was killed by Mockingbird. Could channel Hellfire onto objects. He used a Chain often as a weapon to channel the fire upon then used it as a fiery whip. 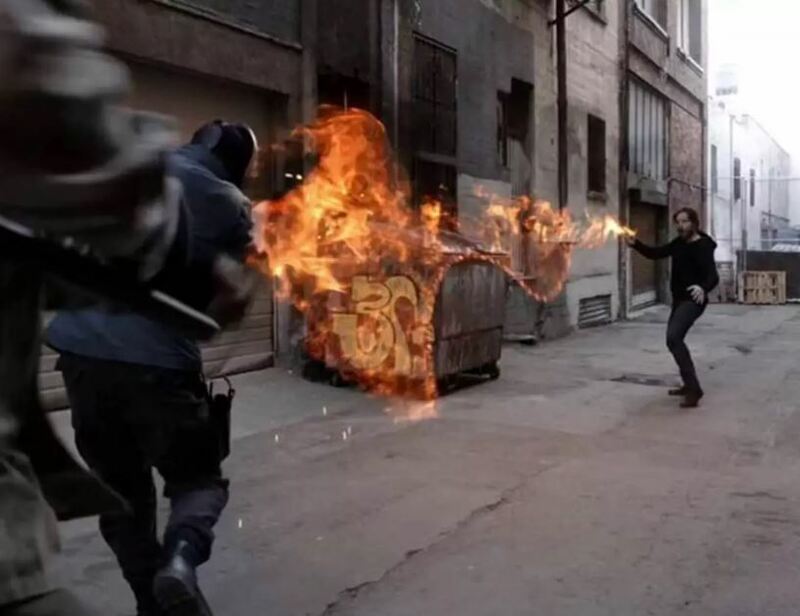 A version of Hellfire appear on the show Agents of SHIELD. Hellfire is played by actor Axle Whitehead. J.T. James is an Inhuman mercenary and demolitions expert who was kicked out of Afterlife by Jiaying for breaking into her archives. His first appearance on the show is "Paradise Lost". In this episode Daisy Johnson and Lincoln appear to ask J.T. about a Kree device in his possession. At this point in the show he does not have powers but is known to be an Inhuman. In the episode "The Singularity", hive causes J.T. to enter Terregensis and when he is through it he gains the power to charge items with energy and fire and cause explosions. He joins the side of Hive. and is later defeated by Melinda May. He later appears working in a Fire Works store when Daisy Johnson and Jemma Simmons come to warn him about an anti-Inhuman group called the Watchdogs. He betrays the SHIELD agents having made a deal with the Watchdogs himself. 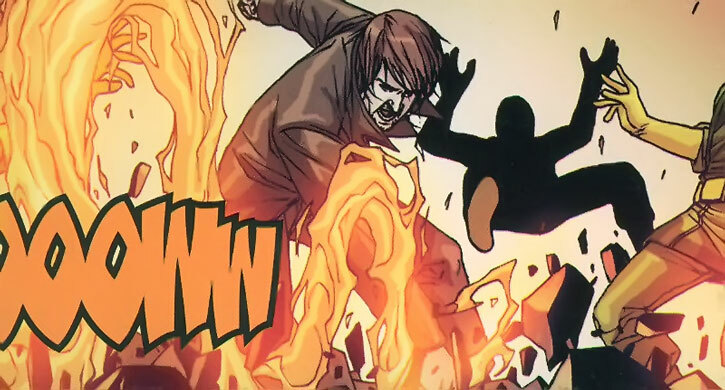 The group is saved by the intervention of the Robbie Reyes Ghost Rider who defeats Hellfire. He is placed into SHIELD custody. Hellfire is still alive and capable of showing up in future seasons of Agents of SHIELD.